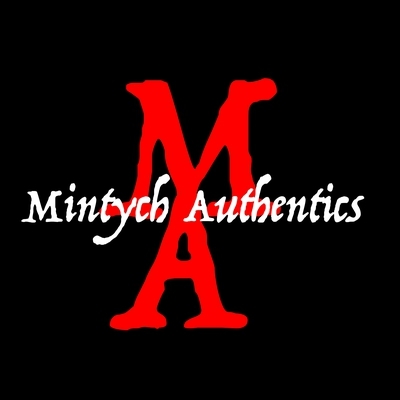 My company Mintych Authentics was formed in 2016 after collecting for many years. I found a love for horror and celebrity autographs and decided to start a company that offers authentic autographs at great prices. 99% of our autographs are obtained through private signings which we conduct all over the country. ELVIRA CASSANDRA PETERSON AUTOGRAPHED SIGNED 8x10 PHOTO! BECKETT COA! HORROR! ALEX VINCENT AUTO SIGNED 8x10 PHOTO! CHILD'S PLAY! COA! CULT OF CHUCKY! ANDY! JOHN FRANKLIN AUTOGRAPHED SIGNED 8X10 PHOTO! CHILDREN OF THE CORN! BECKETT! NEVE CAMPBELL AUTOGRAPHED SIGNED 11x14 PHOTO! SCREAM! BECKETT AUTHENTIC COA! TOM MORGA AUTOGRAPHED SIGNED 8x10 PHOTO! HALLOWEEN! MICHAEL MYERS! BECKETT COA! NEVE CAMPBELL AUTOGRAPHED SIGNED 11x14 PHOTO! THE CRAFT! BECKETT AUTHENTIC COA! COURTNEY GAINS AUTOGRAPHED SIGNED 8X10 PHOTO! THE BURBS! BECKETT AUTHENTIC!